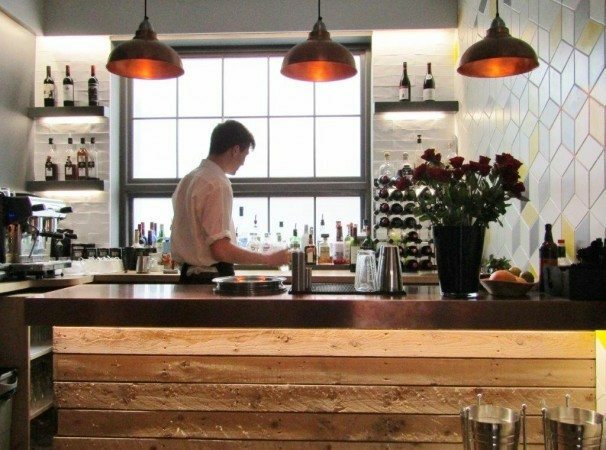 Open since July 2015, Skyfall is a stylish new addition to the ever-evolving Hove restaurant scene. Situated on Church Road, not far from Palmeira Square, Skyfall is dead easy to get to by bus or by car and there is plenty of metered parking in nearby Grand Avenue. 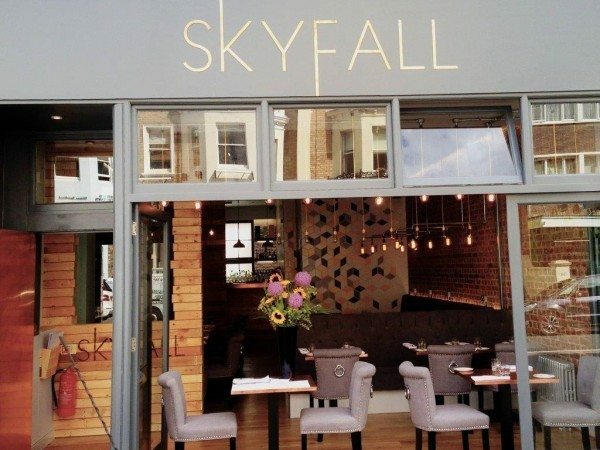 The lovelies at Skyfall aim to serve you local, seasonal, sustainable food at affordable prices. By selecting their suppliers carefully they are able to support local businesses and showcase the highest quality ingredients that Sussex has to offer, including impeccably fresh, sustainably-caught seafood. There are a good selection of drinks available including locally-sourced ales and coffee from Brighton’s very own Roasted coffee company. Food-wise they offer a great value set menu with one course for £7, two courses for £9.50 or three for £12.50, Monday to Saturday, with an additional seasonal dinner menu also available Wednesday to Saturday and, of course, on Sundays you can get your traditional roasts with all the trimmings. There are plenty of plug sockets for charging your devices and free Wifi to keep you connected. You even get a free hot drink with dessert between midday and 5pm on weekdays, so if you fancy a working lunch or just getting out of the office for a bit, Skyfall is the place for you. You can also enjoy the best locally grown musical talent with live music on Thursday, Friday and Saturday evenings and Sunday afternoons. You can even take your well-behaved furry companion (by which I mean your mutt, not your significant other) at quiet times of day but be aware that it is not possible on busier evenings or when there is live music as it gets very full. If in doubt, ring first. 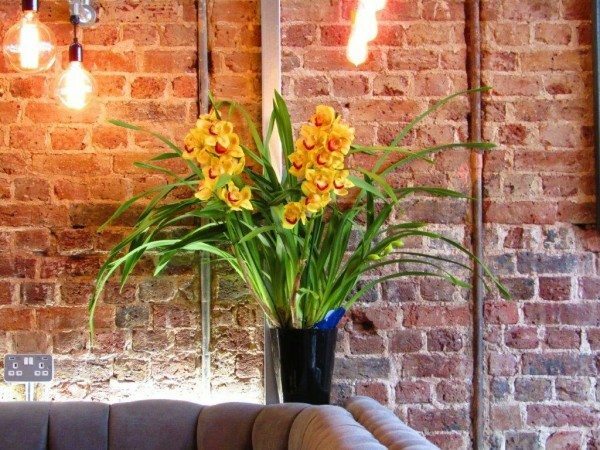 The trendy décor is edgy industrial with clean lines, wooden floors and bare brick walls. The look is completed with copper top tables and those stunning “must have” bare-filament lightbulbs that no self-respecting, up-to-the-minute restaurant can be without these days. 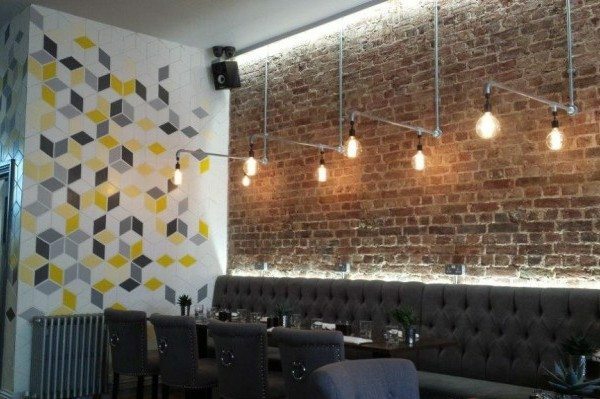 The muted grey upholstered seating is good and comfy and lends itself to leisurely dining. A healthy sprinkling of cute cacti and succulents makes a novel change from the single-flower-in-a-vase look. The service was great, very friendly and helpful but not intrusive and our wine and water were topped up whenever they got low. Funky background music set the feet a-tapping and made for a pleasant, warm atmosphere without forcing you to raise your voice to be heard. 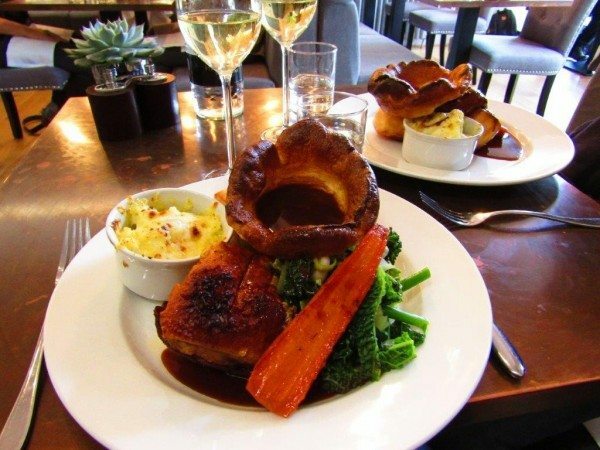 We were there to sample the Sunday roasts and it just so happened that it was Valentine’s Day too, so the perfect opportunity for a romantic treat for two. 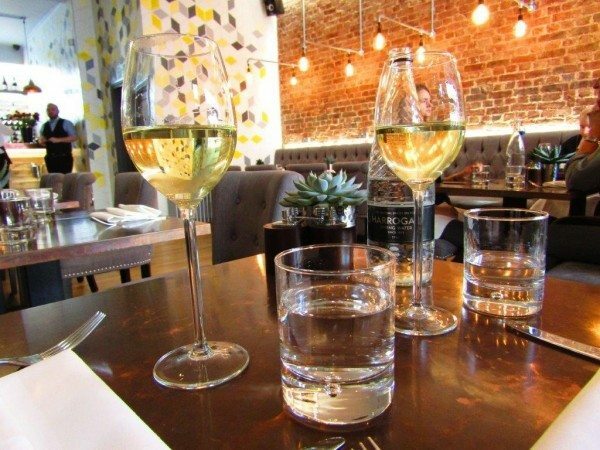 While we negotiated who was going to get what, we ordered a bottle of Peregrino Sauvignon Blanc, which was crisp and refreshing and a perfect accompaniment for the glut of rich food we were about to demolish. When we were ready to order Andrew chose the roast rib of beef and I opted for the pressed belly of pork. Our meals arrived quickly and nice and hot on spotless white plates. Our portions were very generous and liberally coated in dark, rich, impossibly glossy gravy. Andrew got several slices of soft, succulent, medium-rare beef and I got a good-sized cube of moist pork belly topped with thick, crunchy, salty crackling. The accompanying veggies were still crunchy and looked and tasted beautifully fresh. They included carrot, tenderstem broccoli and leeks. Not to mention enormous roast potatoes! 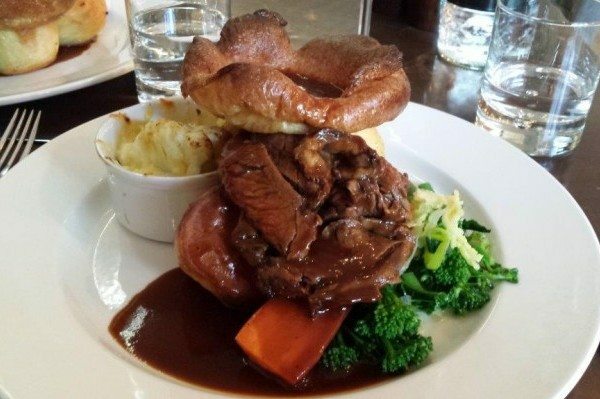 Now the humble spud is a vitally important part of any roast but sometimes they can be a bit tasteless, as if they are just there to soak up the gravy, which is a shame because a good quality spud can shine in its own right and these roasties proved my point. Not only were they crispy and golden on the outside and hot and fluffy in the middle but they tasted properly scrumptious too! We also each got a little dish of delightfully cheesy cauliflower cheese and a lovely big crispy Yorkshire pud. When offered condiments we went for the sweet, tangy, home-made apple sauce for the pork and horseradish sauce and mustard for the beef. For dessert Andrew had the apple crumble with clotted cream and apple syrup and I opted for the dark chocolate brownie with home-made vanilla ice cream and honeycomb. 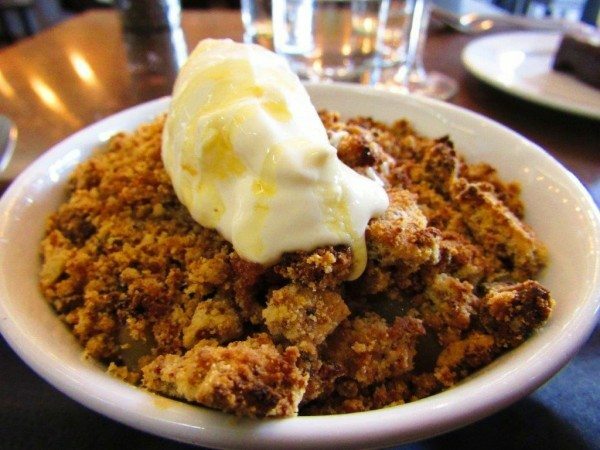 The apple crumble was tart and sweet but not too sugary and the clotted cream was thick and indulgent and melted into the crunchy, golden crumble topping. 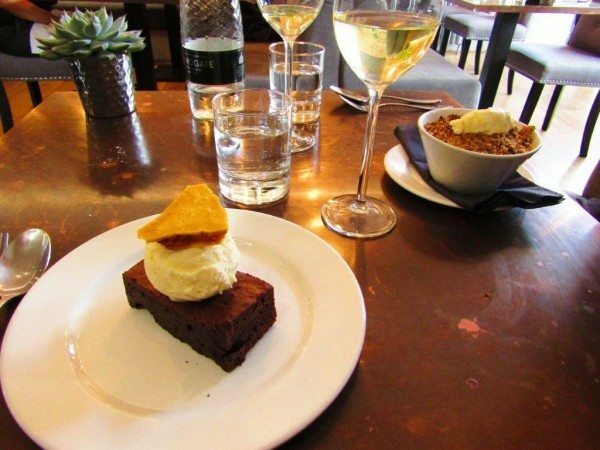 The brownie was sinfully rich, dense, velvety and intensely chocolatey and the ice cream was smooth and soft. The delicious crunchy honeycomb was the icing on the cake, yum! We really enjoyed our meal and, not that we were deliberately ear-wigging, but we couldn’t help notice other customers making happy well-fed noises too. The roast belly of pork cost £10.95, the rib of beef was £12.95 and our puds were £6 each. Our bottle of Peregrino Sauvignon Blanc was £16. So a lovely and very filling meal with plentiful wine for a smidge over £25 a head.